A greyhound friend shared a recipe for slow cooker ribs on her FB page over a month ago and I filed it in the back of my mind to try. I have a slow cooker. I love ribs... For your pleasure I have included the actual directions and the Megan directions. 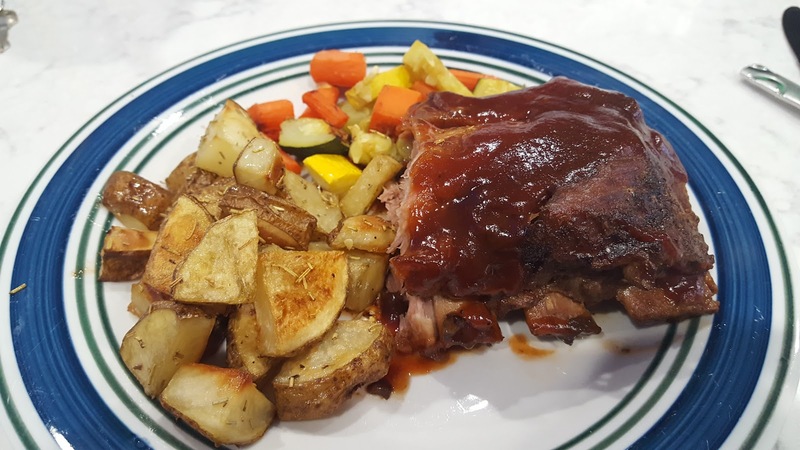 -Buy rack of ribs on sale forget about them in the freezer for a month. -Remember them after making a pizza for dinner because you were too lazy to try. -Decide to put ribs on weekly menu. -Remember the night before that you don't have root beer. -Swing by the grocery store and buy a 2 liter of root beer that is most on sale. -Start to prep the crock pot before leaving for work. -Cut ribs in half since the whole rack won't fit in the pot. -Place ribs in crock pot. -Remember that you were supposed to salt and pepper them. -Add "enough" salt and pepper kinda covering the ribs. -Pour in root beer until ribs are 95% covered (prob could have just poured in the whole bottle, it was only $1). -Set crock pot to cook on low for 5 hours. -Come home 11 hours later. -Prep veggies for roasting, place everything on roasting sheets, place in oven at 400°F. -Drain all the juice from pot (preferably with help because ribs are fragile and will break apart if you're clumsy like me and try to remove them from the pot). -When most/all of the liquid is drained, add "enough" bbq sauce (of your liking) to the ribs and set to cook for 1 hour on high. -Yell at fiancé to get out of the bathroom because he's been in there too long (is this what having kids is like?). -Pull roasted veggies from oven. -Oogle ribs in the crockpot. -Remove silver skin from the back of the ribs. This can be done by pushing the back of a spoon just underneath it, and then working it up and off the ribs with your fingers. -Sprinkle the ribs generously with salt and pepper, and place them into the bottom of a 6-quart slow cooker. Pour the root beer over top. -Cover and cook on low for 5 hours or 3 hours on high. -Remove ribs from the slow cooker, setting aside on plate. Discard liquid from slow cooker. -Place the ribs back inside, along with the barbecue sauce. Be sure to coat ribs in bbq sauce. Cook on high for another 1 hour. -Gently remove from slow cooker and serve with sauce. Ohhhh those look and sound so good!! !